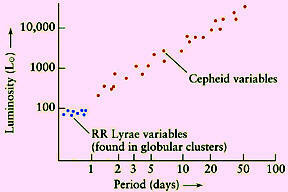 The period-luminosity relation is a correlation between the periods and mean luminosities of Cepheid variables. It was discovered by Henrietta Leavitt in 1912. The longer a Cepheid's pulsation period, the more luminous the star. Since measuring a Cepheid's period is easy, the period-luminosity relation allows astronomers to determine the Cepheid's intrinsic brightness and hence its distance. If the Cepheid is in another galaxy, the Cepheid's distance gives the distance to the entire galaxy.